Stress and fertility are unquestionably interconnected and scientists are now showing how stress plays a very important role in the process of conception, accounting for many cases of unexplained infertility. If you are experiencing stress as a result of trying to conceive, there is little your doctor can do to help you. "Everybody tells you to avoid stress while trying to conceive, but nobody ever gives you the tools you need to do it! " With this article my hope is to introduce a very effective mind/body program based on guided visualization techniques that finally address stress and fertility. Guided visualization has been used in many areas of medicine, including cancer treatment, depression, and psychological disorders like fears and phobias. It has been proven to be very valuable in conjunction with conventional and alternative medical treatments. Now, it has finally been studied and applied to infertility with great results! Guided imagery is a form of relaxation and active meditation, where the patient listens to a recording while relaxing. This program works by helping you release stress and increase your chances of conception both natural or with IVF. You only need to devote 15-20 minutes each day to obtain the maximum benefits. Mind/body treatments of infertility patients have been shown to increase pregnancy rates and to significantly reduce stress. These techniques are based on real scientific findings on stress and fertility. A study published in Fertility and Sterility (2000) investigated the effectiveness of mind/body medicine in a group of 184 infertile women, who had been trying to get pregnant for 1-2 years. The women were divided into three groups. One group followed a mind/body program for a 10 week duration, the next group attended a 10 week support group and the third (the control group) received routine care all through the 10 weeks. The results showed a 55% pregnancy rate within one year in the group of women who received the mind/body treatments versus 20% in the control group. Have you noticed that when you feel stressed you ovulate earlier, late or not at all during your monthly cycle? "In a study conducted at Massachusetts General Hospital in Boston, women ages 21 to 40 used guided imagery techniques to lengthened their monthly menstrual cycles. This study found that 12 of 15 women increased their cycle by 4 days, decreased PMS and mood swings significantly." According to a research study, published in 2003, in the journal of Fertility and Sterility and conducted by Dr. Sarah Berga of Emory University's department of Obstetrics and Gynecology, regular ovulation was restored in women with hypothalamic amenorrhea (lack of periods), after treatment with cognitive behaviour therapy or guided imagery. This study showed a clear connection between stress and ovulation. The women in this study did not ovulate due to excess levels of cortisol, which is also called the stress hormone. "High levels of cortisol as a result of stress do affect hormonal balance and consequently ovulation. This shows how stress and fertility are connected at a physiological level." Stress And Fertility: The Mind Body Connection! 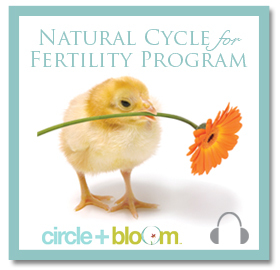 To every women who is trying to conceive, I recommend the Circle & Bloom Mind/Body Fertility Program, which consists in listening to a daily 15 minute audio session specific for each of the 28 days of the menstrual cycle. At the end of each cycle, after listening to this guided imagery program, you will been able to channel and focus on your fertility in a positive and constructive way rather than in worry and anxiety, fearing for the worst. Changing the way you think and the way you feel about your body is essential in changing your fertility status. More and more scientific studies are now showing how mental wellness manifests itself into physical wellness. I really recommend this program to any woman who is trying to conceive, especially if she is going through a difficult time or having to go through IVF/IUI treatments. I like this program so much because it is part of what it's called holistic medicine. Holistic medicine takes into consideration the mind/body connection in wellness and disease. Your body has an innate ability to heal itself. Your vitality has a natural intelligence that permeates every cells and every organ. By using your brain's visualization ability to see in your mind's eye what your body should be doing, your mind becomes the director of your body's physiological functions, restoring health and fertility. 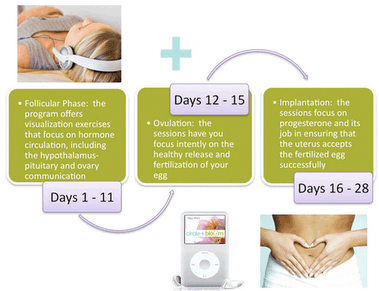 This process is essential to regular ovulation, which depends on creating perfect hormonal balance. Also, the pituitary gland that secretes many hormones necessary for the regulation of the reproductive cycle is located in your brain, this information is key to understanding the connection between stress and fertility. Studies have shown that menstrual irregularities can be caused by the disruption of the hypothalamic-pituitary-gonadal-axis, also known as HPG axis. There are three organs that comprise the HPG axis: the hypothalamus, the anterior pituitary gland, located in the brain and the gonads or ovaries in women and testis in men. These organs secretes hormones that communicate with each other through negative and positive feed-back loops mechanisms. One of the most important functions of the HPG axis is to regulate reproduction by controlling the uterine and ovarian cycles. Think about the level of synchronicity necessary to conceive a baby. The egg has to be released with perfect hormonal timing, then at the same time the uterine lying prepares to receive the fertilized egg, which once implantation is complete signals through the production of pregnancy hormone its presence preventing the shedding of the lining of the uterus. If this process is not orchestrated perfectly, a pregnancy will not occur. "Did you know that every couple in their twenties has only 35% chances of conceiving every month, even if they do everything right? This percentage decreases with age and it's affected by stress. The Circle + Blood Mind-Boy program takes into account the relation between stress and fertility and effectively delivers a guided imagery meditation that helps you release stress and increase hormonal health. It consists of hours of audio divided into daily tracks that follow your body's natural changes associated with the reproductive cycle. Each daily session uses a powerful combination of music, words and guided instructions, designed to help your body manage stress and understand what it needs to do to get ready for conception. You will be visualizing your hormonal levels, the maturation of your follicles, the release of the egg and the proliferation of the endometrium, etc. This initial step is about reaching a state of deep relaxation where you are instructed to consciously release and relax each part of your body. This is achieved through "progressive body scan" technique with visualization and mind relaxation. At the end of this session you will feel completely relaxed and at ease while reversing the negative effects of stress. This session is really neat because it leads you through your reproductive cycle on a daily bases while gently guiding your mind to focus on your hormones. In this deep relaxed state, you are now capable of engaging the mind-body connection and visualize the specific daily physiological changes your body is achieving. This process is very powerful and capable of promoting balance at the hormonal level thus restoring fertility. This last section is also very powerful because it teaches you how to address your emotions, anxiety, and negative thoughts of beliefs that have an impact on your body chemistry. By using your imagination to positively manage what needs to be dealt with, you feel empowered in your healing journey and finally become in charge of your fertility. You realize that your body is powerful and can heal itself. This is where you feel the "shift" from helplessness, depressed and scared to relaxed, confident and hopeful. Circle + Bloom also offers an amazing IVF/IUI Mind-Body Program for women who are undergoing assisted reproductive treatments. This special IVF / IUI program is mainly focused on your IVF / IUI cycle, by paying special attention to fertility medications, synthetic hormones, egg retrieval, embryo transfer, and all the special procedures you might be going through. In doing so, this program takes into account the connection between stress and fertility, not only in the natural cycle, but also when a woman is undergoing medical fertility treatments. During IVF and IUI medical procedures are added to the biological and natural process of the body to facilitate conception. A study was conducted to examine the influence of depression on IVF outcome in 98 women undergoing IVF treatment. The results showed that the women who did not get pregnant had reported increased expression of negative emotions, which correlated with lower pregnancy rates when compared with those who did not experience negative emotions. (Fertility and Sterility. 1998, 69(6):1026-1033). This study reveals how stress and fertility treatment outcome are possibly linked. If you suffer from PCOS, Circle + Bloom has designed a specific program for you. This guided visualization program for Polycystic Ovarian Syndrome is designed to help guide your body back into balance in order to achieve a healthy pregnancy and reduce the effects of PCOS. If you feel stressed out as a result of having to conceive, if you have been diagnosed with unexplained infertility, or if you are going through infertility testing or preparing for IVF/IUI treatments, these programs will help you and give you the best mind-body support you can find.